The Free Trade quilt block is an easy nine patch block comprised of three simple components -- the square, half square triangle and flying geese units. Imagine the possibilities when you play around with your colour choices. 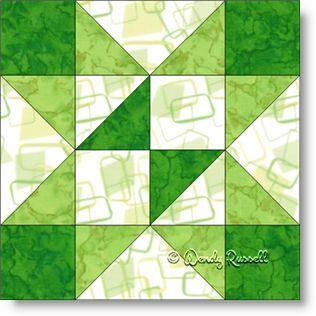 For the sample quilts shown, I feel this block should be called "Luck of the Irish" or something similar. However, that is simply because the quilts are all in various shades of green. By simply changing up your colours you will have a totally different looking quilt. Just be sure to have the same contrast between the light, dark and medium fabrics.